Team Iteration Planning is one of the core scrum ceremonies, no matter how big your company is or how many teams participate in this event. The ultimate goal of planning is to meet the current and future level of the requirement at a minimal wastage as well as to get the most value with the given capacity. Having a prioritized product backlog, the development team discusses each item and collectively estimates the effort involved. The team will then make a Team Iteration forecast outlining how much work they can complete from the backlog. That body of work then becomes the backlog. Targetprocess has made a step towards better visualization of Team Iteration capacity planning. It will be useful for small scrum teams planning and big room planning for scaled agile companies. 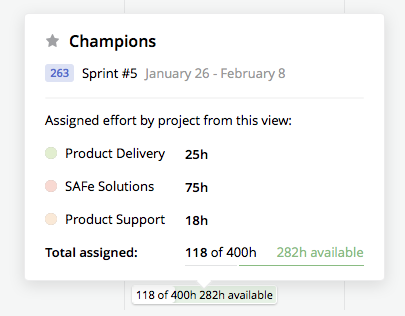 Select Team Iterations as columns, Teams as rows, Feature, User Story, and/or Bugs as cards. You can also select Tasks together with other cards, but never without User Stories, since planning Tasks without their parent User Stories is bad practice, which we do not recommend. We do not recommend to use only Features as cards for Capacity Planning board, since Feature entity itself does not influence Team Iteration effort, only its User Stories accumulate the total effort to do. In order to know if you have available capacity you need to set the limits to compare. This limit is the total number of hours or points available in the team for upcoming team iteration. You can set this value into Team Iteration “Capacity” field. It is possible to calculate the “Capacity” value based on historical data - the number of hours/points delivered in previous team iteration (set average Velocity of previous team iteration) or you can set it manually. Let’s start by adding it manually. Go to Team Iteration entity view and enter a value to "Capacity" field. The next step is evaluating the effort needed to complete each work item. Team takes the highest priority user story (or feature) and breaks it down into smaller pieces - tasks. Then estimate each task in numbers of hours. Once you estimated the work you can assigned it to a specific team iteration. Just drag-n-drop a card from “Backlog” column to the team iteration when you plan to complete it. The badge in a cell will show you how many available hours or points are left. It will also highlight the overload if it accidentally occurred. If any capacity is left, the next high-priority user story is taken. The process continues until there is no more capacity left.